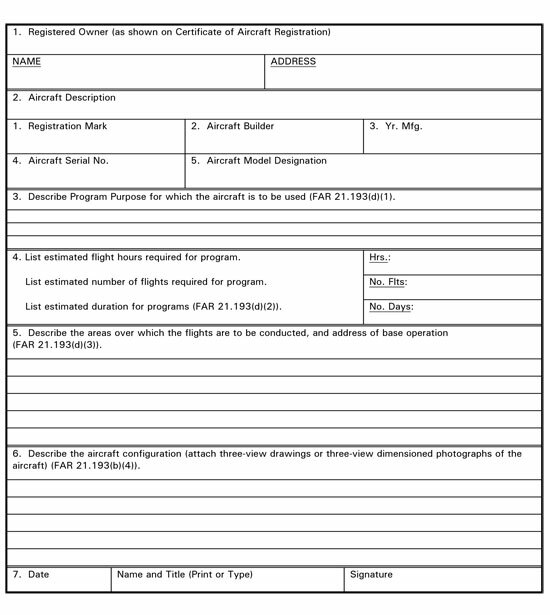 Program letters are used to document and control the special purpose operation that the special airworthiness certificate has been issued for. A program letter must be specific as to the intended use under the special purpose requested, including names, dates, and locations of airshows, air races, or exhibition activities that will be attended. In the case of a movie or television production, the date(s) and location(s) of these productions must be provided. The applicant’s program letter should state a reasonable schedule of events to be attended, but should not list events that would obviously be impossible to attend, for example, listing all airshows scheduled in the United States for the upcoming year. Applicants should be advised that the program letter is subject to review by the FAA and that the owner/operator must notify the local FSDO by letter or fax of any amendments to the proposed schedule prior to that flight. Applicants that do not submit a specific program letter do not meet the intent of FAR 21.193 and shall not be issued a special airworthiness certificate.